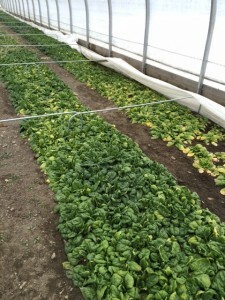 With 100 acres in production and 200 acres in cover crops, Pete’s Greens in Craftsbury, Vermont invests almost more time in managing their cover crops aka “green manures” than they do their marketable crops. But climate smart farming means caring for soils, keeping carbon in the soil (not the air) where organic matter is a key factor in the production of quality crops. As farm manager Isaac explains, “This takes a ton of time – we spend a lot of time dealing with our cover crops. You sort of think you plant it and away you go and you come back two years later. Planting soil into sod and getting the sod to die off before you go back into production is really difficult; it’s machinery intensive. So we’ve been doing multiple cover crops on different fields over two seasons. This is our third planting of oats on this field this year so we took straw off of these fields twice and that’s for mulching.” Isaac uses about 300 lbs of seeds per acre to get the density of oats he wants for green manures. As soil guru Fred Magdoff confirms in his book Building Soils for Better Crops, “It’s not easy .. Improving organic matter content requires a sustained effort that includes a number of approaches to return organic materials to soils and minimize soil organic matter losses… All practices that help to build organic matter do at least one of two things – add more organic materials than was done in the past or decrease the rate of organic matter loss from soils.” Knowing your soil types and rates of aeration and importantly, your starting point for percentage of organic matter will let you know whether your farm is on the trajectory for climate smart farming. Center for Sustainable Agriculture (CSA): Were there any Best Management Practices (BMPs) which were adopted for resilience reasons that didn’t fit into the strategic categories you identified: diversification, water management in the context of soil health, and innovative production? Rachel: The way we selected the BMPs to highlight was that we looked at what the farmers were practicing and the degree to which these farmers felt that the BMPs protected them from the effects of climate change. We definitely could have added more BMPs; rotational grazing is a great example of a strategic practice that can improve soil health and therefore water management on the farm. Manure injection and riparian buffers qualify as BMPs that have great potential to protect farms from some effects of climate change. We chose the practices as examples of what farmers in Vermont are doing now, not an inventory. There were a couple of BMPs that stood out as not fitting into one category, but which spanned many: monitoring of farm ecosystems (aka “agroecosystems”), was highlighted as a key approach for increasing resilience. In brief, if we don’t really know what’s going on in farm systems, it’s hard to make the best decisions about how to adjust farming practices. Having monitoring systems that deliver consistently reliable and useful information is critical for improving sustainability. How to build better relationships between university-based researchers, farmers, municipalities and other public institutions so that the flow of data is used effectively is equally as important as deciding what we need to monitor. CSA: On occasion, we have heard from farmers that they are optimistic about the effects of climate change, such as a longer growing season. Did you speak to any farmers who felt this way? When not speaking in jest, however, several farmers confirm what researchers also know: more frost free days in a growing season is only one piece of the puzzle. Daylight hours, which have a large impact on many kinds of crops, will not change as the climate warms. In addition, increased warm and wet weather could have a negative effect on crops if it is accompanied by an increase in plant pathogens or increased numbers of pest generations. One farmer who grows crops in a river valley in central Vermont noted that even in late summer seasons where frosts did not kill his crops, he faced an increase in pests and plant disease that undermined any benefit he garnered from the warm weather. CSA: Did you notice any BMPs that were of particular value specifically for organic farmers? For conventional growers? Rachel: We interviewed farmers of both organic and conventional operations, but we didn’t notice BMPs that were specific to either group. Often, organic producers distinguish themselves by noting that soil health and the long term sustainability of their operation guides their decision making and therefore their choice of management practices. The group of organic farmers we interviewed for this project echoed this – but so did the conventional growers! One dairy farmer comes to mind who manages a farm spread between several towns in northern Vermont. He is a fifth generation dairy farmer and is very good at thinking about the long term sustainability of his family’s operation. He is particularly attentive to managing the flow of nutrients and water on his farm and uses practices that minimize manure run off and seepage from stored feed. Management practices were based on planning timeframe rather than type of operation – conventional or organic. The BMPs we identified were not aligned with either organic or conventional farming approaches. Rather, we found the more stark distinction between groups of farmers to be based on the timeframe in which they were planning their management strategies. Farmers who think strategically about the distant future of their farm may be more attracted to some BMPs, while farmers who only plan one to five years ahead may be more attracted to others. Each BMP varies in terms of the timeframe in which it is effective. For example, if a farmer diversifies their markets today, they have almost immediately realized the benefit of that strategy. If that same farmer plants a riparian buffer along a stream bank, they may see 15 years pass before that buffer is established. CSA: Effective communication between service providers and farmers requires a lot of work and trust-building; this can be especially true around the topic of climate change. Are there key characteristics of the service providers you interviewed, and the way they communicated that enable them to develop strong relationships with farmers? Rachel: While we didn’t ask farmers specifically about qualities of effective service providers, we did ask them where they received their most useful and trusted information. We can also make our own list of qualities of service providers based on our anecdotal observations of those we interviewed and our experience with this group. However, before they mentioned an organization or technical service provider, all of the farmers said that they relied heavily on their peers. All of the farmers said that they relied heavily on their peers. This tells us that practitioners want to learn from practitioners, and that a good service provider is one that can facilitate learning opportunities between peers. 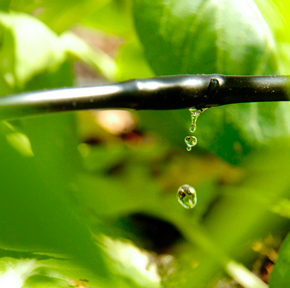 We believe that a deeper level of climate change science needs to be shared with farmers, and that providing opportunities for key individuals to keep abreast of new research will benefit wide networks of farmers. Second, we observed that the technical service providers that could most effectively work with farmers on limiting climate change risk understand climate change on a global level. They take initiative to educate themselves beyond what they hear on the news and can distinguish good quality information from theatrical politics. Rarely do these service providers approach farmers with climate change adaptation as a primary goal. Rather, addressing risk in all its forms is their mission and approach, and sharing the excitement about innovative adaptation approaches is part of what makes them invaluable to farmers. CSA: Thank you for talking with us. Any additional thoughts you’d like to pass along? Rachel: There is a big elephant in the room, and that is that this project is primarily focused on climate change adaptation, but does not address climate change mitigation. 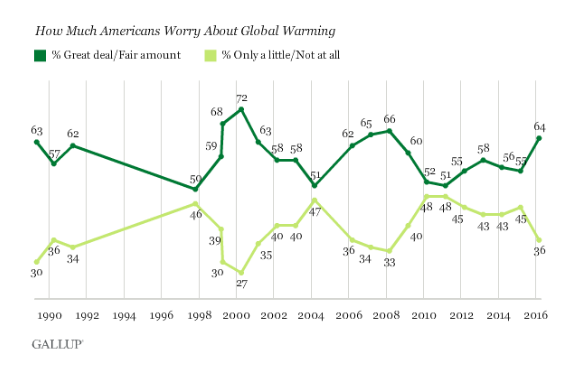 There are some that say that climate change is still too politicized a topic, primarily because of debate over if human activity causes climate change or not. In our study, we found that most people believe that climate change is real, and many believe that human activity is a significant driver. This last point is the most contentious in the United States, as anyone who listens to the news or follows politics knows. We found no one in our small sample of farmers and technical service providers who denies anthropogenic influences on climate change. Furthermore, we contend that in order to be resilient in the long run, we all have to acknowledge humanity’s role in the changes to come. Even as we take ownership of this fact, the science is clear that climate change is happening and we will have to adapt. That is the justification for the focus of our work. The full report can be found here. Schattman, R.E., H.M. Aitken, V.E. Méndez & M. Caswell (2014) Climate change resilience on Vermont farms: a research report for service providers. ARLG Research Brief # 2. Agroecology and Rural Livelihoods Group (ARLG), University of Vermont: Burlington, VT.
Suzy Hodgson at UVM Extension’s Center for Sustainable Agriculture (CSA) interviews Amanda Andrews of Tamarack Hollow Farm about her experience with farming on a floodplain in Vermont and her recent move to higher ground. Can you describe your move to Vermont and farming on the floodplain in Burlington? Amanda: I moved up here in 2010 after working on farms in New York State. My partner and I started leasing land on a former dairy farm, which had been abandoned in 1978. It had changed hands a number of times and the City of Burlington wouldn’t allow residential development; it was zoned agriculture, with the Winooski winding between it and the adjacent Ethan Allen Homestead and the Intervale Center. We knew the Intervale Center socially and knew about the Winooski prime soils there. We knew it was floodplain and what was happening at the Intervale, where it floods yearly in the spring with the snowmelt. Our farming friends said that we’ve only had one flood that was ever a problem in the 20 years we’ve been here. It’s a “non issue.” Flooding wasn’t holding anyone back. CSA: What was your experience farming on the floodplain? Amanda: When we started our farm, there was no problem. We had a normal planting season on 2.5 acres and as part of our lease agreement, we rejuvenated and cleared 35 acres for new pasture for our livestock in 2010. But in 2011, there was the heaviest snowfall in 30 years and that spring was the heaviest rainfall. That year Lake Champlain flooded where the Winooski meets the Lake and it backed onto our farm. The lake level reached a record high of 104 feet. This was our 2nd spring so we thought it must be a freak occurrence. We were under lake level and the water didn’t clear off until the end of June when we could plant. CSA: When and how did you make the decision to move to higher ground? 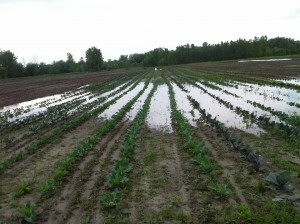 Amanda: At the end of August 2011, Tropical Storm Irene hit and our farm was flooded again. 2011 was a total loss. Having two major once-in-a-lifetime events in one year, we decided seriously to think of moving even though we had just arrived. Summer 2012 was really great but still in the back of our minds, we continued looking, talking with the but most of the available land was large dairy farms without much vegetable soils, and we didn’t want a mortgage, a big old barn, and be tied to livestock. The economic collapse of 2008/09 meant people weren’t spending $12/lb. on meat. Summer 2012 was really great but still in the back of our minds, we continued looking, talking with the Vermont Land Trust but most of the available land was large dairy farms without much vegetable soils, and we didn’t want a mortgage, a big old barn, and be tied to livestock. The economic collapse of 2008/09 meant people weren’t spending $12/lb. on meat. 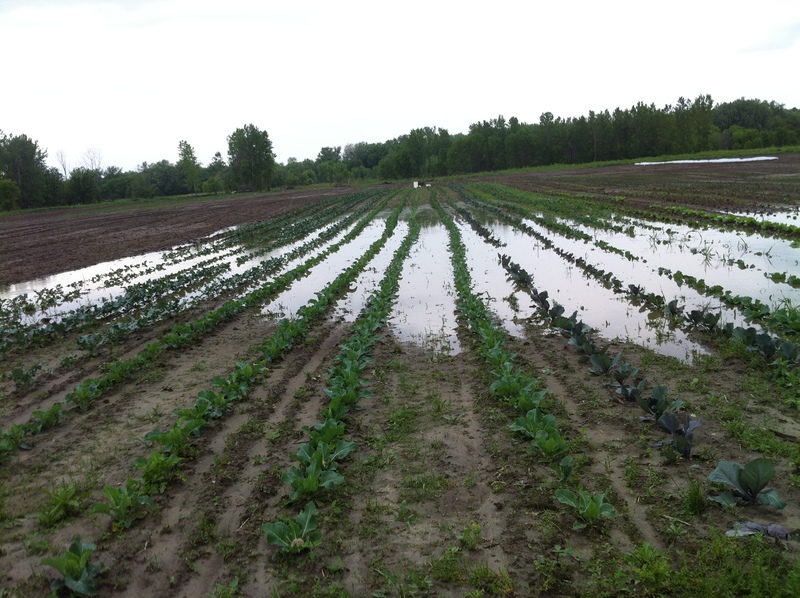 In 2013, our farm flooded in May, June, and July. Spring snowmelt wasn’t a problem; it was heavy rains. 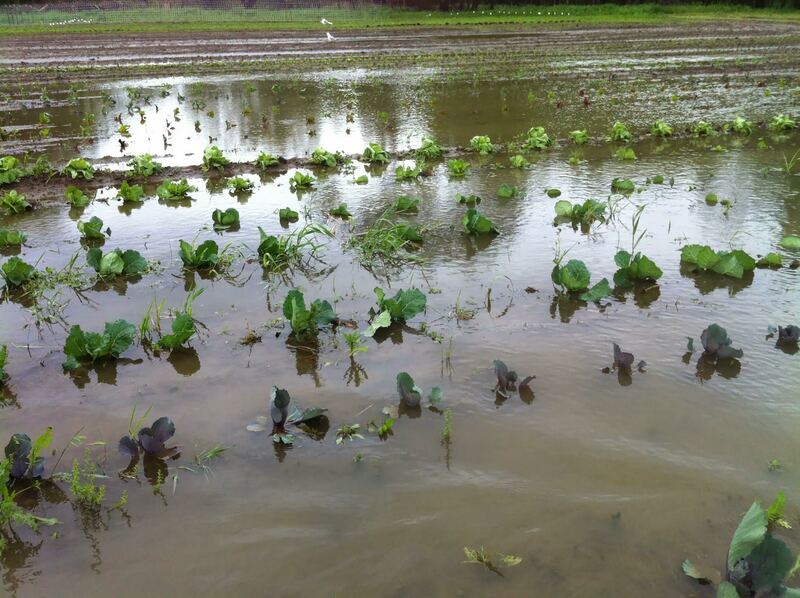 We had standing water on our farm and an adjacent wetland took over 10 acres of our vegetable fields. On July 4, a microburst storm came over the lake from the Adirondacks and hit Burlington; sewers were overflowing in Burlington. The next day the river flooded and our farm was flooded. CSA: What were your losses? Amanda: We had done all our direct seeding in April. We’d planted peas, carrots, beets, potatoes, tomatoes, winter squash, spring greens, we lost all spring and summer vegetable. We had to move all our livestock, equipment, everything off the farm. We put all our workers in furlough and lost upwards of $75,000 worth of produce. We waited for the farm to dry out, and at the end of July, we planted everything. What did work to our advantage is that since we lost so much in May and June, we seeded extra fall crops as we had extra space. Having lost the spring crops, we had space for fall crops, broccoli, kale and kohlrabi. We seeded heavily and had an OK fall – it didn’t put us out of business. If we had flooded again that fall, it would have been the end. 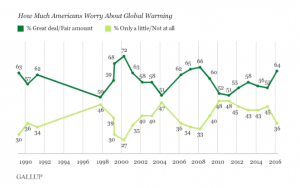 CSA: Have the weather-related effects of climate change been what you expected? Have they been manageable? Amanda: What we experienced in Burlington, it wasn’t necessarily the snowmelt, the historic reasons for flooding, it was heavy rainfalls, short duration, and very very heavy. With four inches-in-a-day rain storm, even if you’re not on a floodplain, that sort of rain can still screw you over. I’d make crop plans over the winter with contingencies on top of contingencies. 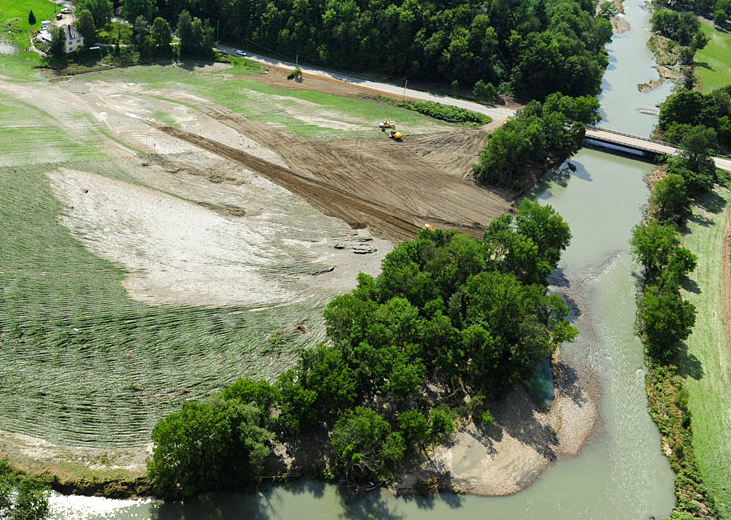 If there is flooding in May, this is what we do; if there is flooding in June, this is what we do. If in August… I had to have contingencies for all of these as we were going to flood at some point during the growing season. People said it’s a flood plain, what did you expect? Floodplains flood predictably, but what happened in the past five years is totally unpredictable flooding and that’s the difference. It’s not that you’re going to flood between April 1 and May 1, which is what it had been for hundreds of years. Now, you might flood in June, July, and/or August; we have experienced flooding in every summer month. That is not in the historical record. The Winooski flood plain is farmed in every town the Winooski goes through. Because we were closest to the Lake, we got it the worst. We got everyone’s floodwater but we’re not the only ones going through this. It’s definitely a risk, if you’re further upstream, flooding may be manageable. Downstream, we were flooding that much more often. It’s a tradeoff for that prime soil. CSA: What particular site characteristics were you looking for beyond higher ground? Amanda: A lot of the farmland that exists in Vermont is on the Winooski and for obvious reasons we shied away from this. What we wanted was really, really well-drained soils. We weren’t interested in dairy farms as they had poorly drained and shallow soils. And anything with clay was out. I cross-referenced potential agricultural parcels with the State’s soil maps for soil types, topography, forests, wetlands, and water bodies. 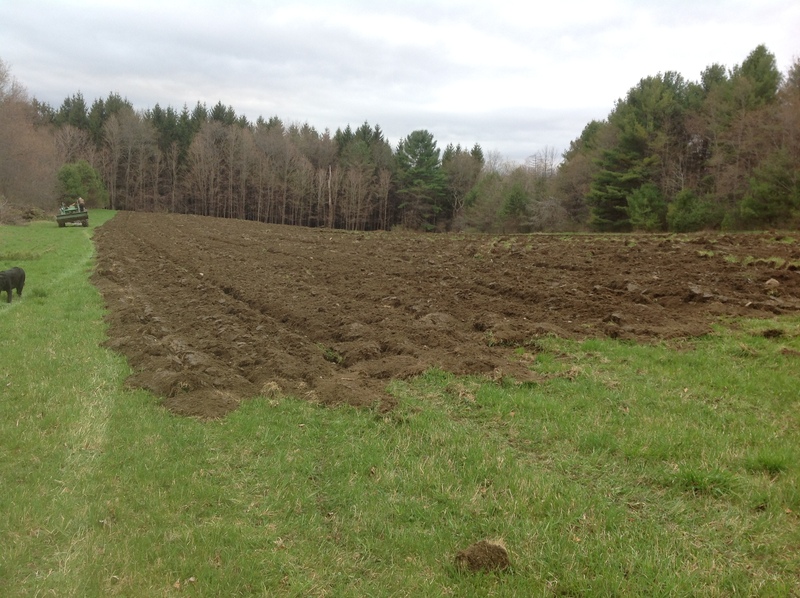 We found an agricultural parcel with Vershire-Dummerston complex – a sandy loam – which is very well drained., not A+ but 84 on the scale 1 to 100 with no asterisk for flooding risk like our Winooski farm. Plowing the new farm, Tamarack Hollow Farm, Plainfield, May 9, 2014. Photo credit: Amanda Andrews. CSA: Are you planning to change your crops? Amanda: There will be slight change in our crops. Down at the Intervale, our planting was bottom heavy. Our experience of climate change is that the spring season is shrinking; it’s later to start, with very heavy storms, and heats up rapidly. Now we have high dry land, so we can get to our fields in spring but spring is not as long. My experience is that spring is starting later and ending earlier. We’ll have high tunnels for spring production and perennials that come up on their own so I don’t need to be in the fields to cultivate. We’re trying to do things that aren’t dependent on tractors in the spring when soils are wet. A big risk is increased diseases. 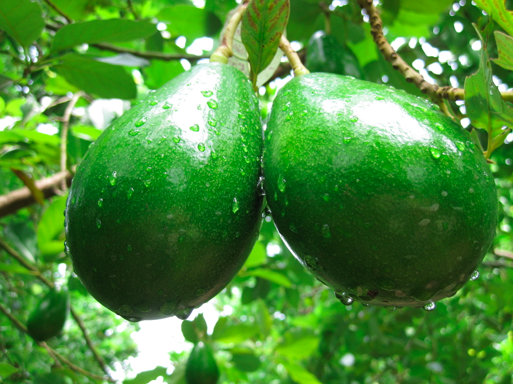 We’re getting diseases and pests that used to just affect southern growers. We don’t grow berries yet and are looking carefully where we put them. We are looking for disease resistance in our seed varieties and there’re lots of successful breeding programs and surveys to see what farmers need in varieties. It is troublesome. I wish we could grow all heirloom varieties, but as diseases are shifting, the resistance packages bred into the heirlooms no longer cut it. And we have new weed species moving up from the south. We need to know how much viable weed seed is in the soil and to keep that down as a long-term management goal. CSA: Moving forward, how are you planning for climate and weather changes? Any specific example for plants? Amanda: We’re buying rhubarb and asparagus and getting perennials established. We’re growing more herbs as you can get them in the ground earlier in the spring. The first project we did after water and power was put in a huge walk-in cooler. 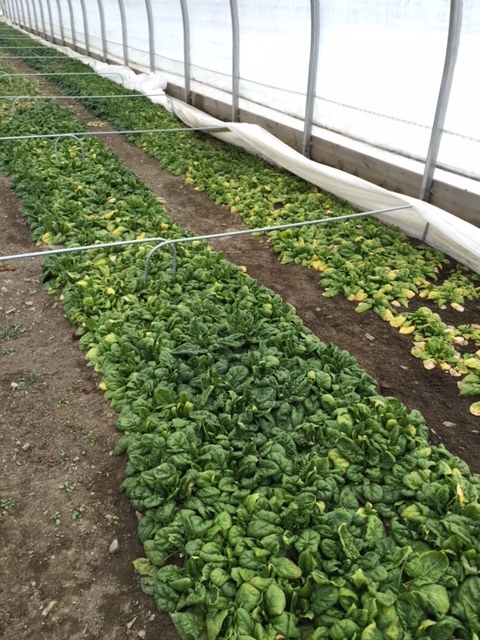 For us, business plan-wise, lots of fall crops are easier to grow, fall is extending. While we’re losing spring, we’re getting longer falls. So we are trying to be very fall heavy to make more income in the winter so we can be buffeted from the shorter spring. It’s a shifting calendar. We’re not considering strawberries, it’s becoming more and more difficult due to a lot of spring rain making it difficult for strawberries to fruit. Ten years ago, we probably would have put in an acre of strawberries as that was the thing to bring people to your farmstand. Instead we have ton of storage crops that we can sell in the December and January and markets have been responsive. Now you can grow rutabagas and carrots and sell them. CSA: What advice would you give to other farmers from what you learned about climate change? Amanda: Farming was hard enough before climate change, it’s not like it was easy before and now it’s really hard. If you really want to be a farmer, there’s nothing that can be said to keep you from trying farming. What did the farmer do when he won the lottery? He kept farming until it was all gone. You’re going to keep doing it until you’re broke. I can’t imagine surviving climate change in a bubble. 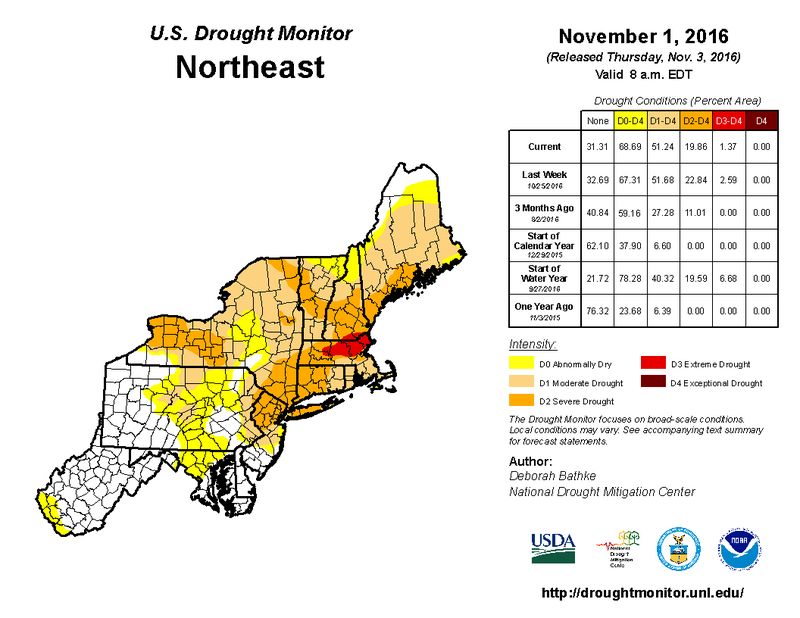 Our greatest resource for planning and surviving is communicating with seed companies, growers, Extension services, knowing what’s happening in southern VT, MA. What’s a problem for them this year will be a problem for us next year. I have peers in Pennsylvania and talk to them all the time. If you look at Vermont projections for climate change in 50 years, it’ll be Pennsylvania.